"Old, But Not Obsolete Yet"
Here we are with the fifth entry in the Terminator franchise. As with any new installment, we wonder what, if anything, will we see that ends up surprising us? What will we get that is new and fresh? These are questions that become even more potent, particularly when you are dealing with a 30-plus year old franchise that comes with many tropes that nearly everyone is already familiar with. Can an old dog be taught new tricks, essentially is what we are all wondering and we will see the movie to find out. We catch a brief moment of a time before the war between the machines and the humans. 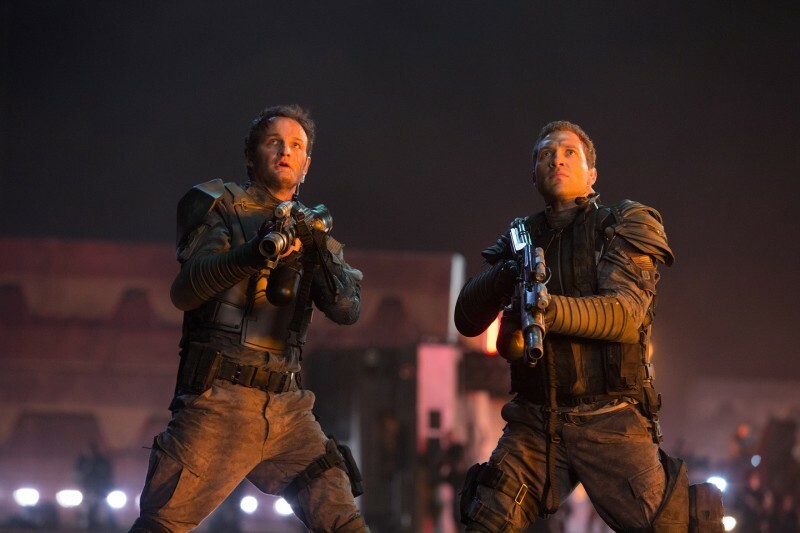 Kyle Reese (Jai Courtney) explains the fall of man and the rise of machines and soon, we find ourselves thrown into the thick of the war as John Connor (Jason Clarke) and his soldiers plan to execute a final battle against Skynet that will end the war for good. The trouble is, Skynet, the self-aware enemy, thought ahead and sent a Terminator back in time to kill Sarah Connor and end everything before it begins. Sound familiar already? If so, good. Know that this is where the similarities end, which should not surprise you if you have seen any of the trailers. Terminator Genisys, acts as a retroactive continuity to the series where everything we thought we knew of the story and the mythology has been altered. This film completely ignores the events of the previous two installments and simply deals with elements established in James Cameron's two earlier films. With that, comes a great deal of fun you can feel. The film takes great joy in playing in the sandbox of the Terminator universe established by the first two films as there are great references to both, while introducing some references of its own that future films could be linked to. All the actors involved come to this film infused with the vitality the series needed to give it a jump start after the last two films of the series. Emilia Clarke is a capable Sarah Connor here, though she's still a far cry from Linda Hamilton's prime Sarah Connor in Terminator 2: Judgement Day. She has great emotional beats, which were unexpected, but welcome nonetheless. Jai Courtney is okay as Kyle Reese. He is having a good time being a part of the fun, though it should be said that his role could have been played by anyone and could also have carried more substance. Jason Clarke's John Connor goes in a different direction and he carries the torch to unexpected places in a good way. The biggest draw for the film though, is Schwarzenegger, who is at a point now in his career where he is enjoying himself more than ever in the role of a T-800. Being older actually works well for him in this story, much better than expected. It is a treat to have Schwarzenegger playing one of the more recognizable characters in pop-culture, which he helped create. The film definitely would have suffered without him. The film's story is plotted-out well enough with sufficient payoffs in spite of what may or may not have been spoiled by the more recent trailers of this film, which brings up an interesting question about how films like this are marketed. Still, there are more surprises in store for those who chose to catch this film, which is not cerebral like T2, but it is as entertaining as T2 and more in line of something that could follow. It turns out that this old dog of a franchise may yet have some new tricks up its sleeves after all.